Picture shows Teresa Jaynes at work in her studio. Jaynes stands to the viewer’s left. She looks at her hands as she adjusts a large-size, wooden sculptural letter between lines of blue tape on a white wall. About the curator: For more than 25 years, Teresa Jaynes has created installations and artists’ books based on extensive research in special collections and libraries including: The Rosenbach Museum & Library, Penn Museum at the University of Pennsylvania, and the Newberry Library. Her projects often expand over several years with different stages of research, learning a new craft and mapping out a series of interrelated components that coalesce into ambitious and highly nuanced work. Philadelphia-based, Jaynes received her MFA from Tyler School of Art, Temple University and her BFA from the University of Texas at Austin. She is a recipient of a Pew Fellowship in the Arts, as well as grants from the Independence Foundation, Art Matters, National Endowment for the Arts, and Pennsylvania Council on the Arts. Jaynes has exhibited her work in New York, Chicago, Minneapolis, and Philadelphia. Pablo Batista during a concert. The Library Company of Philadelphia, Philadelphia Jazz Project, and Free Library of Philadelphia invite you to enjoy a special performance by world-renowned master percussionist Pablo Batista and his Latin Jazz Ensemble. Expect an evening of dialogue, humor, passion, and community. This is a free event, but please RSVP by September 9. We ask you to register for the reception, trolley, and the concert individually. We are providing trolley service one way from the Library Company to the Free Library, but space is limited. Free street parking is also available. Let us know if you require any accessibility accommodations, and we will be happy to assist. The evening begins with a reception and viewing of Common Touch: the Art of the Senses in the History of the Blind. Finally, join us in the beautiful Skyline Room at the Free Library of Philadelphia for a lively and moving performance by percussionist Pablo Batista and his Latin Jazz Ensemble. Philadelphia native and percussion master, Pablo Batista is a 2000 Pew Fellow and graduate of Temple University, who has performed, recorded, and toured with a range of leading jazz, R&B, Latin, Pop, and Gospel artists including Bono, George Howard, Alicia Keyes, Gerald Levert, Jeffrey Osborne, Eddie Palmieri, Teddy Pendergrass, Diane Reeves, Grover Washington, Jr., Musiq, Manny Oquendo’s Conjunto Libre, and the Philadelphia Orchestra. In 2015, Batista received a Pew Center for Arts & Heritage Project grant for El Viaje (The Journey), a performance work blending traditional Afro-Cuban rhythms and contemporary Western instrumentation with Afro-Caribbean choreography. As a songwriter and composer, Pablo’s musical direction is the result of many years of study, research, and blending folkloric drumming, dance, and chant with the great American music he’s been listening to and playing, for decades. Pablo is inspired by his roots and moved by the struggles it took to get to this point. As a passionate teacher he shares what he was taught and has gathered over his career, about time and rhythm. Join us for a night with the Vision Council, the five-person advisory committee to artist-in-residence, Teresa Jaynes for Common Touch: The Art of the Senses in the History of the Blind. The Council will reflect on Common Touch from their point of view. These individuals each have a unique visual acuity —from complete blindness at birth to the development of low-vision later in life. The multi-disciplinary members include a world-renowned musician, former executive in the fashion industry, a classical vocalist, a tri-athlete, and an art director. Explore the exhibition and hear from the Vision Council during an evening of reflection and conversation on navigating the predominately-sighted world from the perspective of those with vision loss. The conversation will tap into their stories – then and now – on education, perception, and the tools and technologies used to negotiate the world. For more information, please contact the events coordinator at (215) 546-3181. If you require any particular accommodation, please indicate that in your registration or call (215) 546-3181. The Library Company of Philadelphia is an independent research library specializing in American history and culture from the 17th through the 19th centuries. Open to the public free of charge, the Library Company houses an extensive collection of rare books, manuscripts, broadsides, ephemera, prints, photographs, and works of art. The mission of the Library Company is to foster scholarship in and increase public understanding of American history before 1900 by preserving, interpreting, making available, and augmenting the valuable materials in our care, thus providing meaningful stewardship of the legacy of founder Benjamin Franklin. Join us for the celebratory opening of Common Touch, a multimedia exhibition of new works by artist-in-residence Teresa Jaynes. Common Touch explores the nature, foundations, and limits of perception through the juxtaposition of Jaynes’ multisensory artwork with historical materials documenting the education of the visually impaired in the 19th century. Picture shows Terry Galloway, standing and tilted to her left and with her hands up to her wide-open mouth.She shouts into a large -size ear that is the “face” of a person dressed all in black. A red curtain adorns the background. 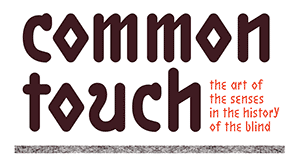 Join Teresa Jaynes, artist-in-residence at the Library Company, as we explore the artistic process of Common Touch. Enjoy an overview of the Library Company’s Michael Zinman Collection of Printing for the Blind and learn how it inspired Jaynes to embark on a multi-year journey of research, exploration, and creation. Jaynes will share her perspective on this unique art installation where the world of 19th-century historical collections intersects with a new world of tactile expression. Blindness trails a long history in imagination. Award-winning writer Stephen Kuusisto, author of the New York Times “Notable Book” Planet of the Blind (1998) discusses blind history and its place in art. Stephen Kuusisto teaches in the Center on Human Policy, Law, and Disability Studies at Syracuse University. He is the author of numerous works, including Only Bread, Only Light: Poems (2000) and Eavesdropping: A Memoir of Blindness and Listening (2006). Picture shows bust-length portrait of Stephen Kuusisto with his dog. In the lower left edge of the image to the viewer, Kuusisto rests his left cheek on the knuckles of his left hand. He wears dark-shaded glasses and a black T-shirt. Above his head is the head of a yellow Labrador posed in left profile. The dog wears a metal choke collar with a dog tag.